Spectral methods have long been popular in direct and large eddy simulation of turbulent flows, but their use in areas with complex-geometry computational domains has historically been much more limited. More recently the need to find accurate solutions to the viscous flow equations around complex configurations has led to the development of high-order discretisation procedures on unstructured meshes, which are also recognised as more efficient for solution of time-dependent oscillatory solutions over long time periods. Here Karniadakis and Sherwin present a much-updated and expanded version of their successful first edition covering the recent and significant progress in multi-domain spectral methods at both the fundamental and application level. Containing over 50% new material, including discontinuous Galerkin methods, non-tensorial nodal spectral element methods in simplex domains, and stabilisation and filtering techniques, this text aims to introduce a wider audience to the use of spectral/hp element methods with particular emphasis on their application to unstructured meshes. 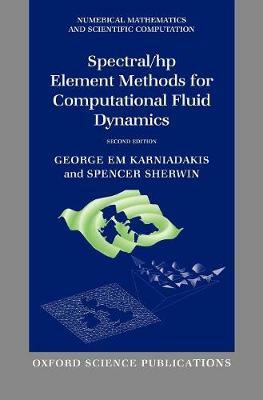 It provides a detailed explanation of the key concepts underlying the methods along with practical examples of their derivation and application, and is aimed at students, academics and practitioners in computational fluid mechanics, applied and numerical mathematics, computational mechanics, aerospace and mechanical engineering and climate/ocean modelling.